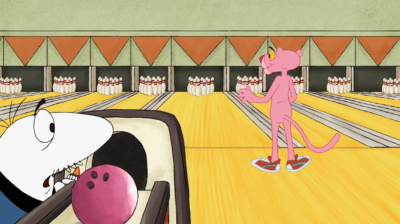 Pink Panther competes with Big Nose in a bowling tournament. In spite of his efforts to sabotage Pinky's game, things don't go Big Nose's way. Eventually Pinky bowls a perfect game. But with a little rubber glue trick, Big Nose is able to get a few strikes of his own. He then tries to stop Pink Panther from getting his 300 trophy, but his efforts backfire as he destroys the bowling alley and falls just short of getting his own perfect game.